Things are certainly improving daily. There’s still a lot to be done as people are trying to get closure on insurance and focus on rebuilding. The hillsides are green right now though. The shipment of teddy bears was finally released. Scott (Director) will soon send you pictures of the children with the bears in hand. We just can’t thank you enough for thinking of the children in the BVI after such a traumatic event. Realizing that they are not alone and that people from far away care about them and their troubles has made such a difference. They hug their teddies with the brightest smiles we’ve seen since the disaster. 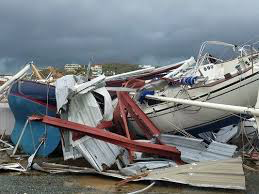 With the local economy in tatters and the annual tourist season fast approaching, dealing with hurricane boats – and thousands of tones of other storm debris – is becoming an urgent priority for the BVI. But those expecting the paradise of old might have to wait. 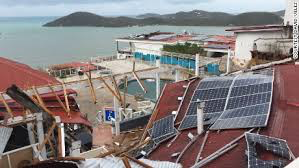 When the BVI took the full force of Hurricane Irma on 6 September, it was the most powerful Atlantic hurricane ever recorded, with winds that averaged 185mph, gusting to 215mph. 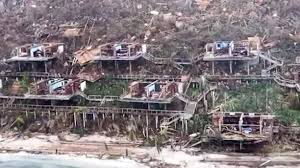 Less than two weeks later, the islands were hit for a second time by Hurricane Maria. Such was the force of the wind that even boats secured in the most sheltered lagoons cartwheeled huge distances – as did cars, shipping containers and roofs. Almost every tree was stripped of leaves and bark, then broken or blown away.